After being tested at extremely low temperatures for more than two months, the four instruments of the James Webb Space Telescope are preparing to come in from the cold. First indications from the NIRSpec and MIRI teams are that both instruments have performed remarkably well during these most recent tests in space-like conditions, but there are many weeks of data review to come before the teams will know if the instruments are ready to move to the next stage of integration with the telescope. By mid-February, the instruments will have reached room temperature and will leave the cryo-vacuum test chamber at Goddard for the last time. 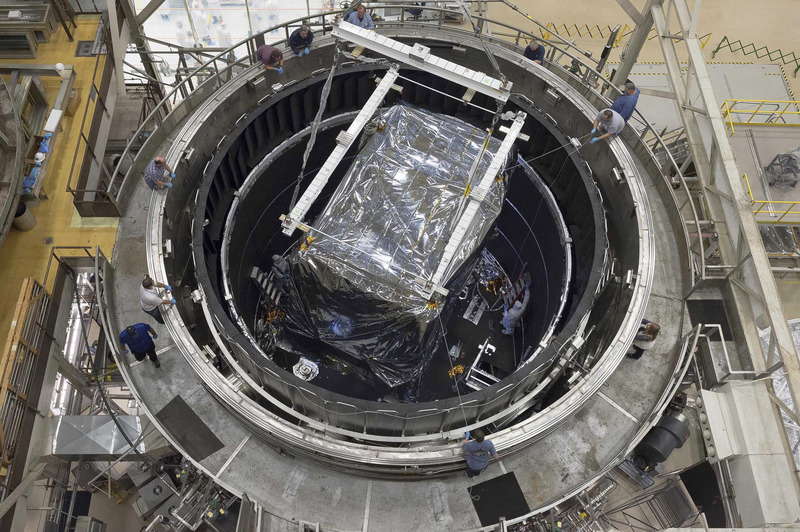 This overhead view of the Space Environment Simulator (SES) test chamber at NASA's Goddard Space Flight Center in Greenbelt, Maryland shows the Integrated Science Instrument Module (ISIM) lowered into the chamber for the third long-duration cryo-vacuum test.